For many patients, rehab can help with recovery from a stroke, heart attack or other serious health conditions. Few, however, are as dedicated to maintaining their health as 85-year-old Chet Gilbert. 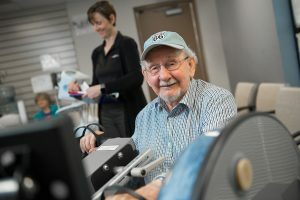 In late February, Chet marked his 1,000th cardiac rehab session at the Memorial Rehab Services at the Memorial Physician Services–Petersburg clinic. During the eight years, he’s become an unofficial mascot and ambassador for the clinic—a strategy that his physical therapists joke can sometimes backfire. “Sometimes he tells new patients how many times he’s been here, and that scares them off,” quipped physical therapist Nick Allen, who baked a cake in honor of Chet’s 1,000th visit. Joking aside, Chet said rehab played a crucial role in maintaining his quality of life despite some health struggles. A positive attitude has helped too. Following his philosophy that personal relationships are the most important thing in life, he’s quick to befriend his fellow rehab patients and make them laugh. “He loves people, he loves life and he’s genuinely interested in everyone,” therapist Thelma Hinton said. Chet was first referred to rehab in 2010. The program helped him bounce back after a variety of health problems, including several heart attacks, kidney failure, mini-strokes and blood clots in his lungs. His health crises in recent years have led to several stints in nursing facilities. But as soon as he was well enough to return to his home, he would come back to rehab at the Petersburg clinic. “Therapy would bring him back every time,” Sharon said. He puts this philosophy into practice by going to rehab three days a week, using equipment like the arm bike and step machine as well as walking laps around the clinic. During those laps, he likes to stop and chat with clinic staff and patients in the waiting room. Not only has working with the therapists helped him recover from his ailments, he said, it’s also helped him monitor his overall health. For Chet, the people he meets are as important to his long-term health as rehab itself. He gets to know all his fellow patients, sharing stories about his years as a trucker and the country music stars he met as owner and operator of the Illinois Country Opry in Petersburg from 1969 to 1979. He also talks about his family, which includes two grown children, eight grandchildren and 12 great-grandchildren. Wherever he goes, laughter tends to follow. An avid woodworker, Chet is well-known in the community for selling birdhouses and donating the proceeds to the local food bank. He also gives birdhouses to the people he meets in rehab. When a fellow patient misses a rehab session, he always follows up and makes sure they’re OK.
“He cares about everyone who comes out here to the program,” Thelma said. Chet said he couldn’t have made it through the past eight years without the camaraderie and health benefits of the Petersburg rehab program. And he wants the rest of the community to know that as well. “It’s very important what they do here for us,” he said. Congratulations on your continued recovery. You are one heck of an example for other less believers, sir! I proudly take my hat off to you😊 To me, you are a walking, talking testimonial. And having a couple of years under your belt in the happil-ever after department in marriage 👏🏻❗️ Thank you for letting someone share your story. As an old friend of Chet and classmate of Sharon’s , I really enjoyed reading this article about Chet.I’ve had a few health problems, and he always remembers and asks about them ,when he sees me, and as you have quoted him, he always tells me “you’ve got to keep moving”. Chef is my wonderful uncle. Love him so very much . He is a true blessing from God. Hi Chet, dad (Earl) and I miss talking to you. Keep up the good work. Great to see you smile:) Have a great day.